Stingless bees of the genus Lisotrigona are uncommon species found in India and South East Asian countries. Several Lisotrigona species including L. cacciae, L.carpenteri and L. furva from Vietnam have been described. There has been no information on the chemical constituents and bioactivity of Lisotrigona stingless bee propolis in Vienam. Our goal of this work is to investigate the chemical constituents of the stingless bee Lisotrigona furva propolis collected in Binhdinh province, Vietnam. Using combined chromatographic methods, several triterpenes including mangiferolic acid (1), occotilones I (2) and II (3), dipterocarpol (4), hydroxyhopanone (5) and (13E,17E)-polypoda-7,13,17,21-tetraen-3β-ol (6) were isolated from the ethyl acetate extract of Lisotrigona furva propolis. The chemical structures of isolated compounds were identified by MS, NMR spectral analysis. Compound 5 and 6 were isolated for the first time from stingless bee propolis. Acknowledgements: This research is funded by Vietnam Academy of Science and Technology under grant number VAST.HTQT.BULGARIA.02/17-18. 1. Nguyen, H. X., Nguyen, M. T., Nguyen, N. T., & Awale, S. (2017). Chemical Constituents of Propolis from Vietnamese Trigona minor and Their Antiausterity Activity against the PANC-1 Human Pancreatic Cancer Cell Line. Journal of natural products, 80(8), 2345-2352. 2. Sanpa S., Popova M., Bankova V., Tunkasiri T., Eitssayeam S., Chantawannakul P. (2015). Antibacterial compounds from propolis of Tetragonula laeviceps and Tetrigona melanoleuca (Hymenoptera: Apidae) from Thailand. PLoS One, 10(5), e0126886. 3. Yoon, N. Y., Min, B. S., Lee, H. K., Park, J. C., & Choi, J. S. (2005). A Potent Anti-complementary acylated sterol glucoside fromOrostachys japonicus. Archives of pharmacal research, 28(8), 892. ISNAD THANH, Le Nguyen , OANH, Vu Thi Kim , THOA, Ha Thi , PHUONG, Diep Thi Lan , LIEN, Nguyen Thi Phuong , GIAP, Tran Huu , HANG, Nguyen Thi Minh , HUNG, Nguyen Van , BANKOVA, Vassya . "Isolated Triterpenes from Stingless Bee Lisotrigona furva Propolis in Vietnam". 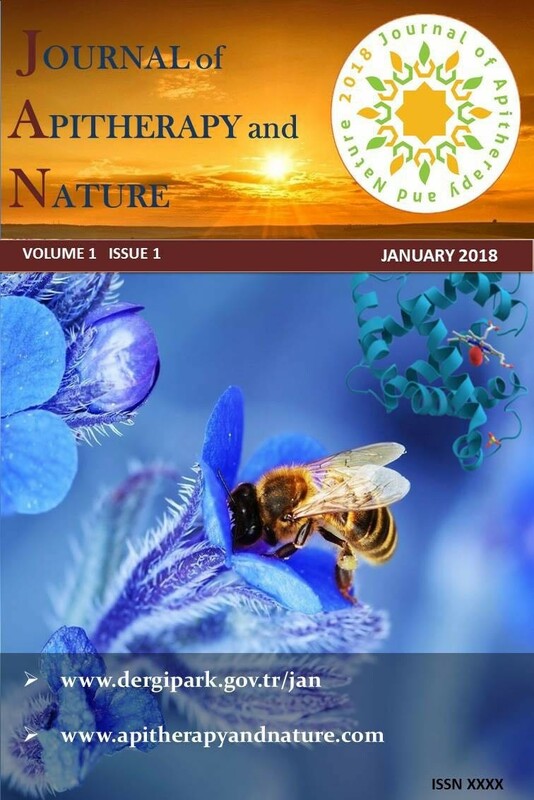 Journal of Apitherapy and Nature 1 / 3 (December 2018): 73-73.